Good morning everyone, Amy Copeland here this morning with a cute scene card featuring Hello Bluebird stamps. I originally had a card teed up to post today featuring their new bumblebee set (Bee Happy), but I made this one after the bee card and changed my mind--I wanted to share this one ASAP. 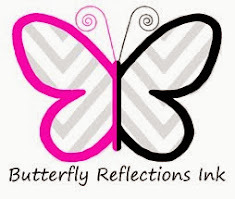 :) I will have the bee card up next week, so watch for that. 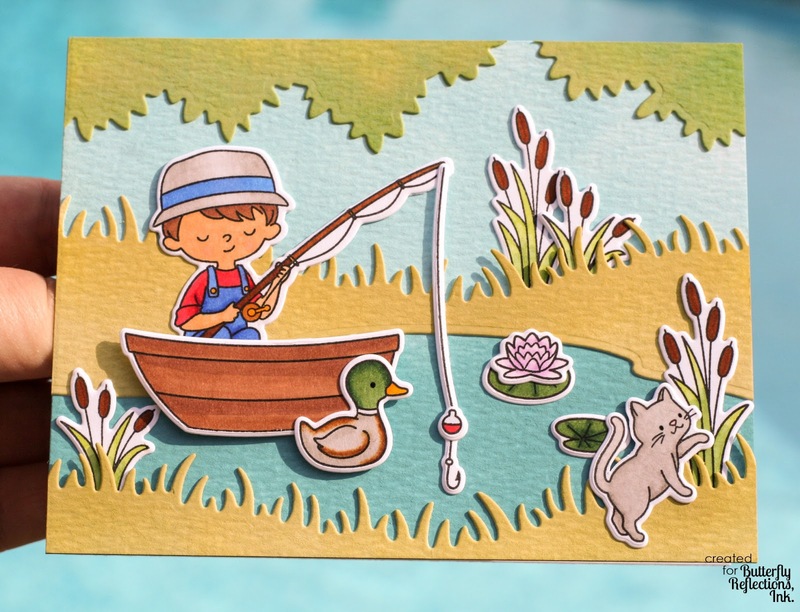 I started my card by stamping the images from Fishin' Hole with Copic Marker-friendly ink onto smooth white cardstock. I colored all of them in with my Copic markers, then used the Coordinating Fishin' Hole Dies to cut out the images. 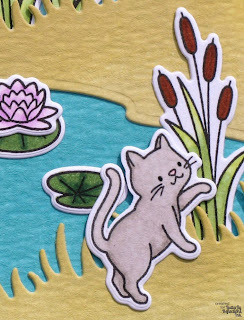 I used my Precision Scissors to trim the excess white cardstock in between the kitten's tail and body/head because I didn't want that extra white space to be a distraction. 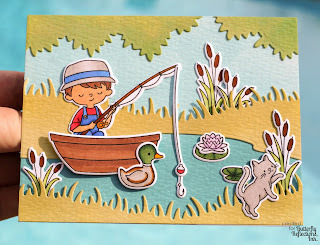 For the second panel, I applied Old Paper Distress Oxide all over the entire watercolor paper piece. I then used the Pond Builder dies to cut out the "trees", the pond, and the grassy borders along the top and bottom of the pond out of the Old Paper panel. On the "ground" pieces surrounding the pond, I blended a tiny bit of Crushed Olive Distress Oxide ink on the edges for a little more definition. On the "tree" pieces, I used Mowed Lawn a little more heavily over the Old Paper-colored pieces to give them a different look and for more interest. 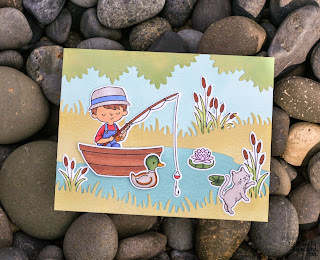 I used Liquid Glue to adhere all of the elements onto the two-toned blue panel, with the exception of the boat and the duck--I used Foam Tape to adhere those images for some dimension. 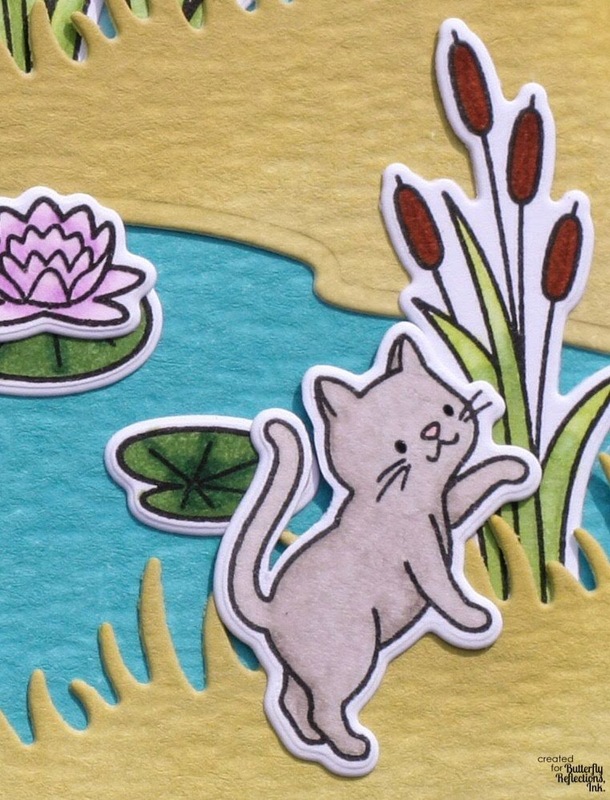 The only extra embellishment on this card was using a Black Glaze Pen on the kitten's and duck's eyes to make them a little darker and for a tiny bit of shine. I adhered the whole thing onto an A2 (5 1/2" x 4 1/4") card base and left the inside blank for now--I will stamp the sentiment when I figure out the recipient of the card. My husband suggested, "A bad day fishing beats a good day working," so I might use that and give it to him...hahaha!